This article first appeared in the 2013 edition of 'Bookbinder' and appears here with the kind permission of its author Alex McGuckin and the Society of Bookbinders. Over the past decade, I have given annual demonstrations on bookbinding to visiting students from the University of Alberta. 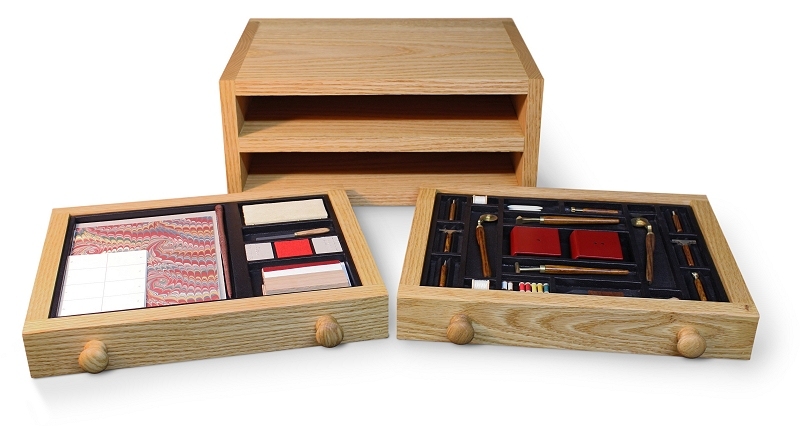 Recently, I was asked if I could take my demonstration out of the comfortable surroundings of my bindery and into the lecture hall. Sitting in front of my computer and staring at Microsoft's Powerpoint, I came to realise very quickly that, without the luxury of my bindery as a backdrop, it would be a considerable challenge for me to describe the binding of a book if I did not have available all of the tools and materials related to its construction. The challenge, then, was whether I could create a practical teaching aid that would show examples of many, if not all, of the tools and materials it takes to bind a book. 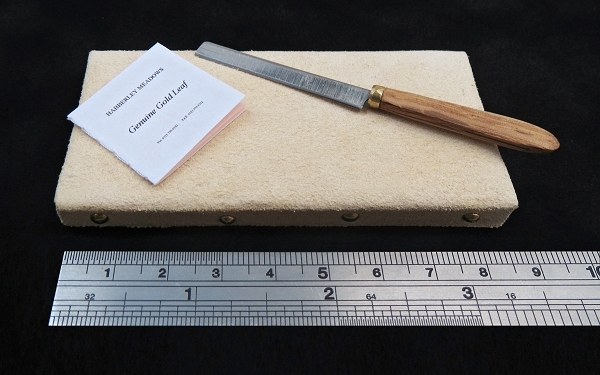 At first, the idea was just to bind two miniature blank books, identical in every respect, with the exception that I would leave one of the books uncovered so as to reveal the skinless anatomy of a traditionally hand-bound book. With the structural elements exposed, it would be possible for students to see how the paper, thread, and board worked together to create a perfectly functional binding. This was important for a number of reasons. 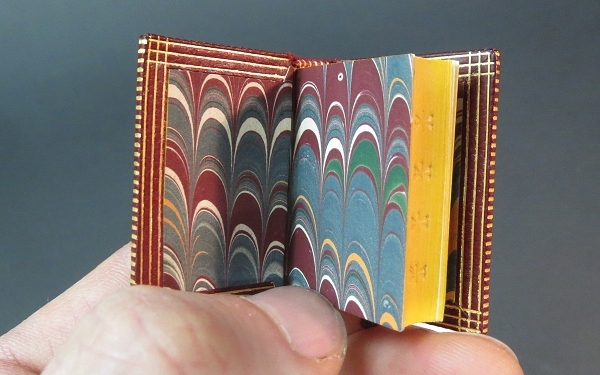 First, I was keen, from a miniaturist's point of view, on demonstrating how these very small books were bound using the exact same methods and materials I would have used had I been working on a normal-sized book. Second, I wanted these miniatures to offer insight into how a book is made. 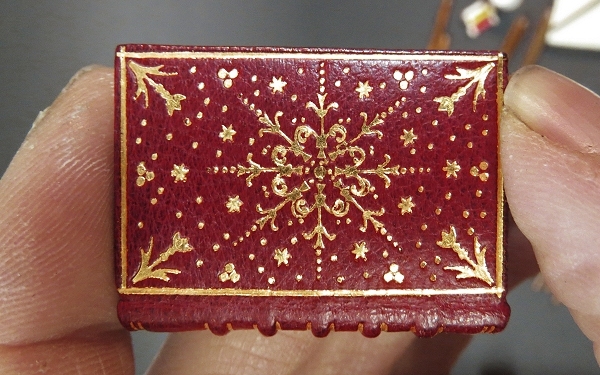 While the 'exposed' binding demonstrates the inner workings of a bound book, its counterpart, clothed in crimson leather and finished in gilt, illustrates the culmination of all the steps that lead to a book's completion. Soon after I completed the miniatures, I felt compelled to expand the scope of this project significantly to include all the materials and tools that I used to put these books together; that is, to create a self-contained 'bindery in a box' that could be used by instructors and curious bibliophiles to explore the various component parts of a hand-bound book. After much experimentation (and many split handles) I was able to find a way to make and engrave convincing and functional miniature bookbinding tools. I settled on a scale of 1:3.5, an ideal size that allowed the tool to be handled without too much difficulty and yet maintain its functionality. 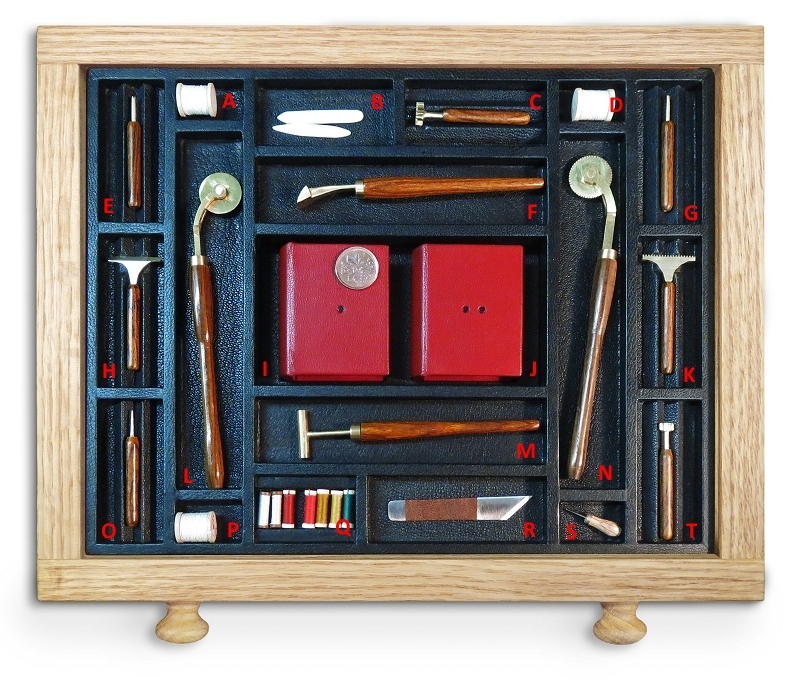 Every miniature tool included in this box is a near-exact replica of a tool or item that was used in the binding of the two miniature blank books. 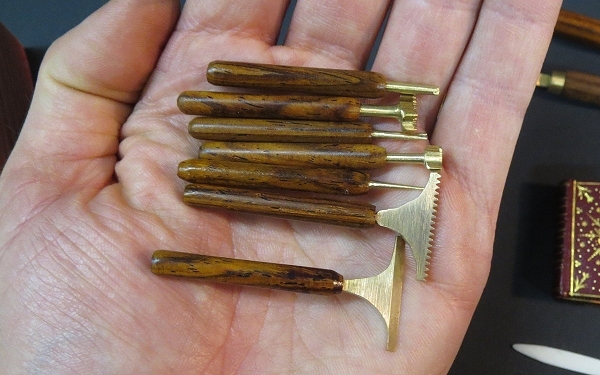 For aesthetic purposes, I did depart from my normal practice of fitting maple handles on my finishing tools. 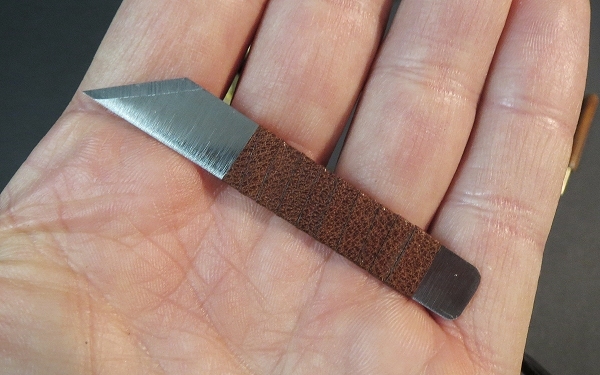 Instead, I opted to use cocobolo, an exotic hardwood with a deep rich colour and contrasting grain that significantly enhances the appearance of the smaller tools. A - Paper samples. 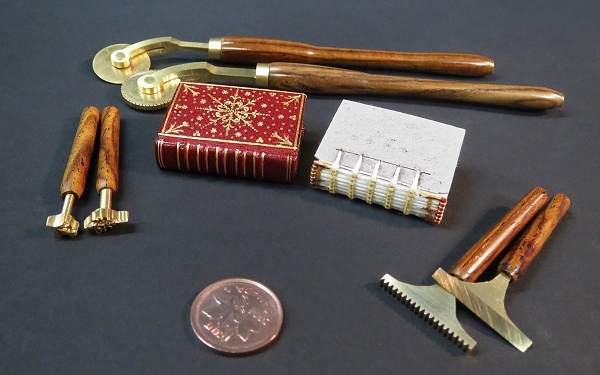 Paper-based materials used in the construction of the miniature books. Fabriano Ingres Bianco paper. Folded three times to create one octavo section. Permalife bond paper. Machine-made acid-free bond paper used to line and 'pull' the boards. Payhembury marbled paper. Hand-made marbled paper by Kate Brett. Used to create the endpapers. Eskaboard (1.3mm). Binder's board used to create the covers of the books. D - Front board. 'Nicked' and 'holed' board, ready to receive the slips from the text-block. 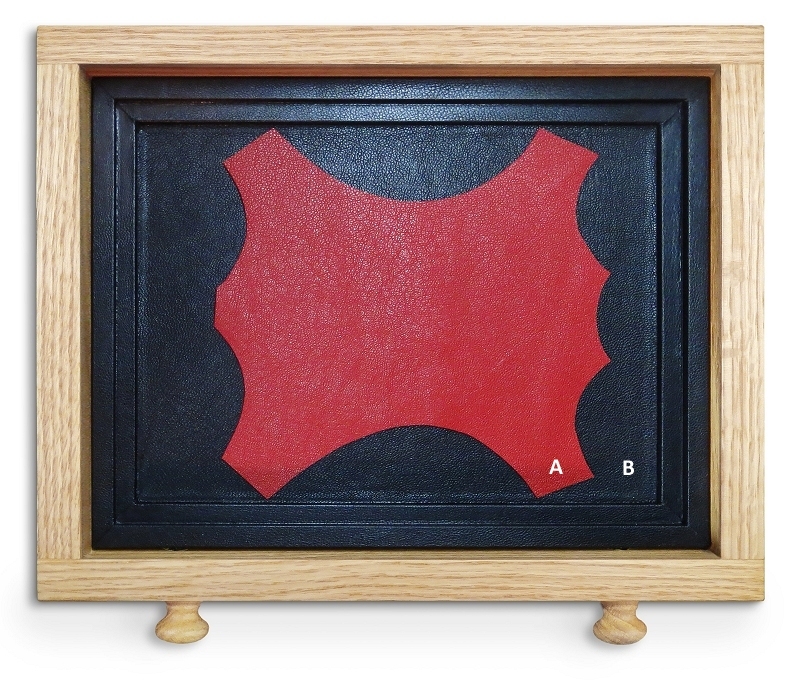 I - 'Exposed' binding (boxed). Seven sections sewn on five raised cords laced into the boards. The coin (to show scale), is a Canadian penny, which is slightly smaller than a British penny. J - 'Finished' binding (boxed). Full goatskin binding with gilt decoration. 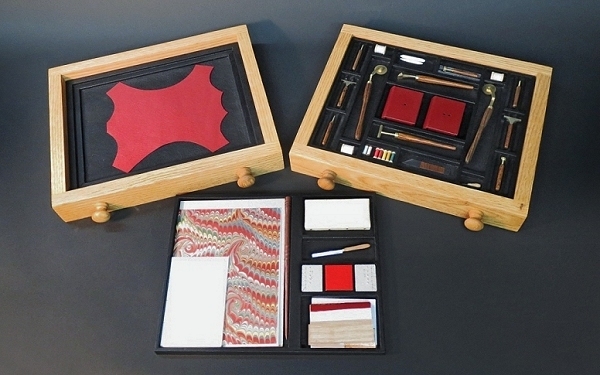 With the exception of a handful of items such as the lying press, sewing frame, and needles, and organic items such as paste and albumen glaire, everything that was used to create the crimson gilt miniature blank book and its 'exposed' counterpart, from the various papers, binder's board, thread, and leather, to the aforementioned hand tools, are all represented in the custom-built solid oak cabinet. The complete work is titled The Anatomy of a Book. While I cannot claim that this is a comprehensive study of the physical book, I do hope that my 'bindery in a box' provides some insight into the anatomy of a hand-crafted leather-bound book. 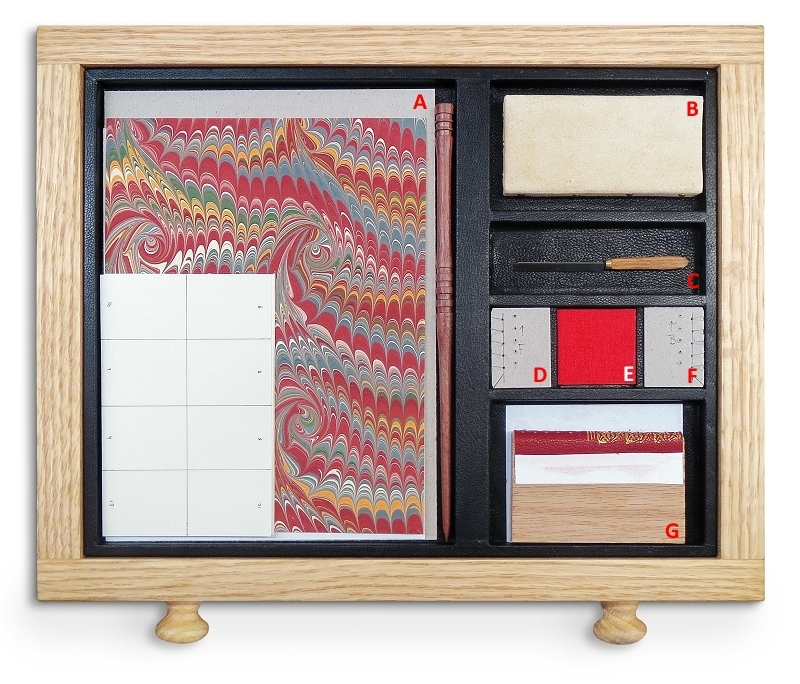 Alex McGuckin is based in Edmonton, Canada, and has dedicated the last fifteen years to studying the craft of bookbinding. What began as a rather intensive hobby during his four-year residence in England became an all-encompassing passion upon his return to Canada, so much so that he decided to leave academia and pursue bookcraft full-time. 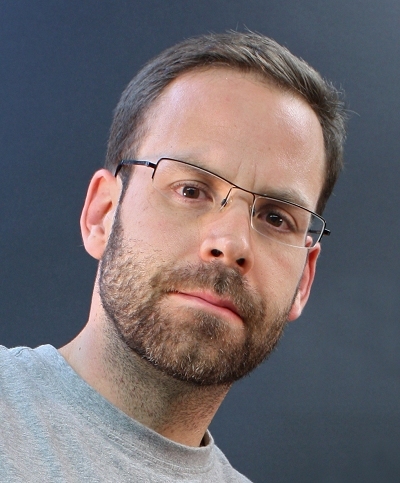 Alex has been binding professionally for the past thirteen years and specialises in period restoration.